With the holiday season behind us, The Valley Lo Club Valentine party followed Cupid’s lead and shot an arrow into FUN! Felix and Fingers drove out to Glenview, Illinois for a Valentine’s Day themed event at the Valley Lo Country Club. 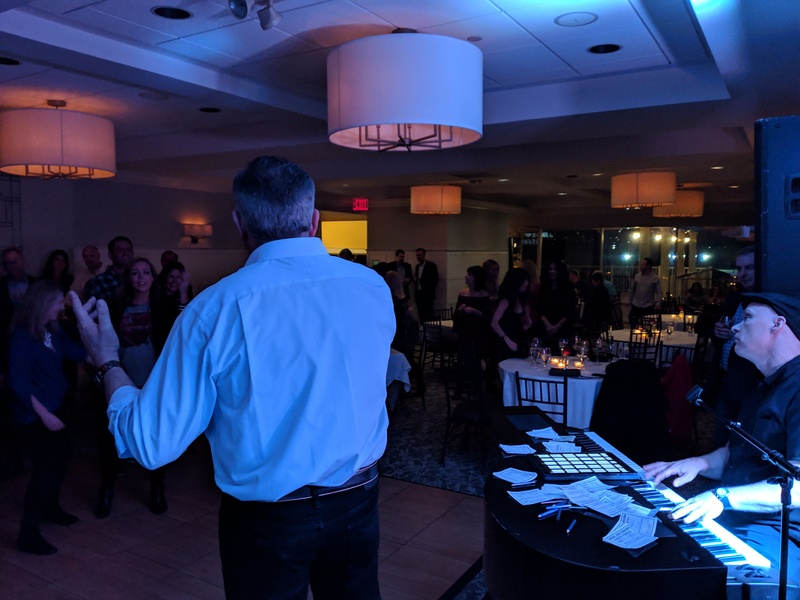 Not only was this Valentine’s entertainment night a SOLD OUT ticket show, but it was an awesome way to promote club member activity! 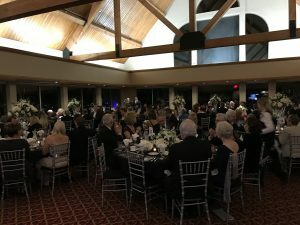 The Valley Lo Club Valentine party was the ideal get together. Guests enjoyed the accommodations of a full-service clubhouse that overlooked a pristine 28-acre lake. Not only is the Valley Lo Club located 20 miles North of Chicago, but it’s a year-round vacation spot perfect for the whole family. If you are interested in touring Valley Lo Club please click here. Our performers for this fun valentine-themed event were Duncan Parker and Chris Heroldt. We were indeed relieved that Duncan Parker’s soaring tenor was back on display after a short stint on the injured list. We missed you Duncan! At Felix and Fingers we love any excuse to celebrate a holiday – big or small! 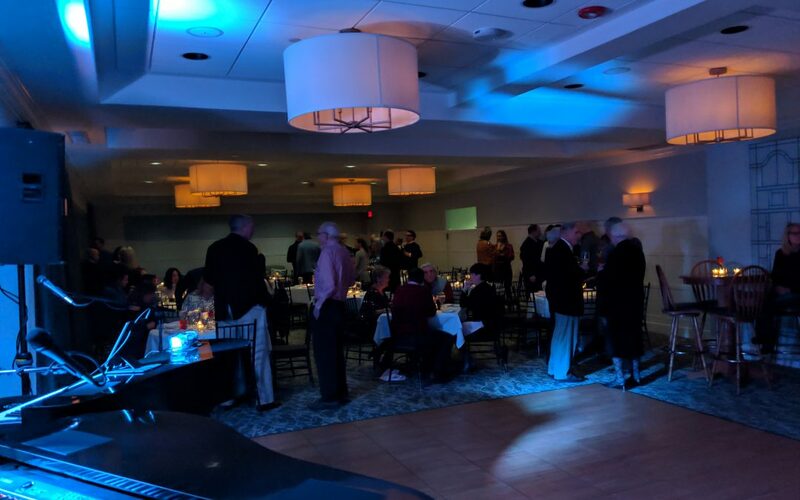 For a start, the Valley Lo Club Valentine party had approximately 100 club members attending our interactive dueling piano show. Everyone was ready to have a great time! Cocktail hour kicked off with Valentine by Martina McBride and the dance floor was packed within minutes. If there’s anything that makes our hearts flutter, it’s cutesy, heart shaped hors d’oeuvres. For example, a buffet of heart shaped mini pretzels, quiches and a blueberry goat cheese log paired well with the flowing champagne. All in all, everything was delicious! 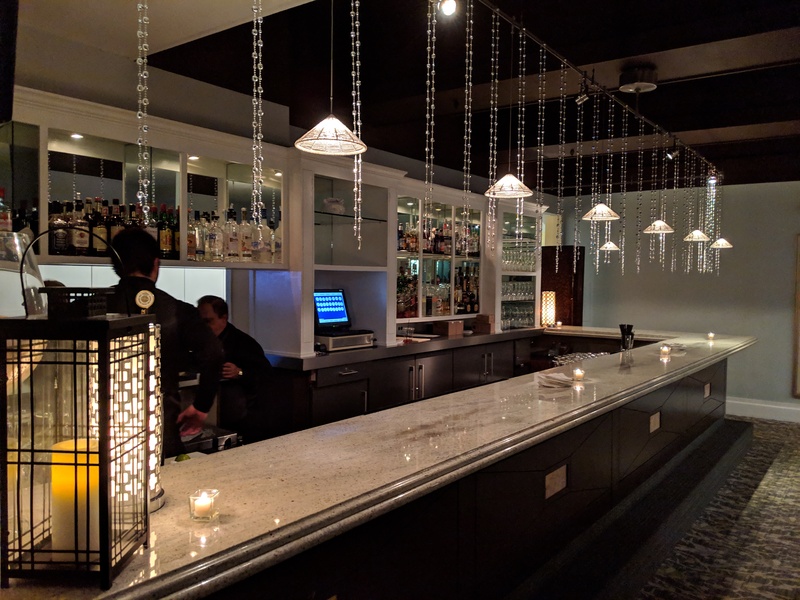 The Valley Lo Club Valentine party had some pretty jazzed up digs. Hence, romantic ambiance was maximum impact with balloons, candles and fresh roses EVERYWHERE. Dinner was tapas style with a full bar service. Hence, the bartender was on full Cosmopolitan duty all night long. When it was time for dessert, we couldn’t resist the huge chocolate cupcakes with red heart sprinkles. They were outstanding! While it’s always tempting to play love songs on Valentine’s Day (or anti-love songs), at a party like this we fought the urge. Felix and Fingers know how to make the Valley Lo Club audience happy. In other words, we HAD to play, Ain’t No Mountain High Enough, Ain’t No “VALLEY LO” by Marvin Gaye and Tammi Terrell. The crowd LOVED it! One of the highlights of the Valley Lo Club Valentine party was a dude in a giant country belt. In fact, this guy got up on stage belting out Friends in Low Places by Garth Brooks. To be honest…it was 100% authentic. Above all, we eventually pulled out some old standards for the lovebirds in attendance. Guests enjoyed slow dancing to My Funny Valentine by Frank Sinatra and That’s Amore by Dean Martin. Hard to top for romance. Felix and Fingers had a blast at the Valley Lo Valentine party! We loved seeing everyone have a great time, enjoying delicious food and a fun interactive show. In the end, our client complimented us on how HAPPY they were with our performance. If our gig is what you’re searching for, send us an email to info@felixandfingers.com or click here for more information. We look forward to hearing from you soon!